A very nice small range bag for those who don’t want to carry their whole safe to the range, but still need a bit of storage for a single bag trip. This will carry two pistols and accessories with the reinforced design to handle the weight. Eyes, ears and ammunition will easily accompany your two pistols, mags, and small scale cleaning equipment. Blackhawk! Is producing top quality soft sided bags and cases for the shooting enthusiast that ensure you get a good price, but also a great product. The workmanship is of a high level and the utility is high as well. 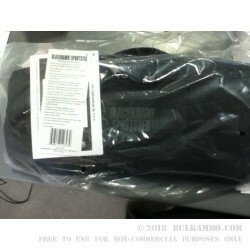 In the case of the Sportster Pistol Range bag, you’re getting a lightweight, easy to carry bag that is reinforced for oversized loads and carries heavy weight items like a champion. The reinforced strap webbing goes around the entire bag circumference offering great support without making the bag too rigid. The zippers and dual density foam is top quality and will hold up to normal use for many years. Approximate dimensions of 16” long with a 9” height and an 8” depth, means you’re going to have plenty of room for items up to and including using this as a “Go-bag’ in the trunk of your car, or for general range use. 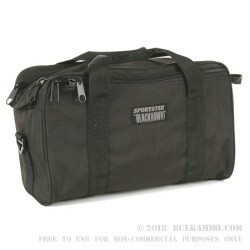 The utility is high, and this is a versatile bag that can fit in at work, the gym or the range.